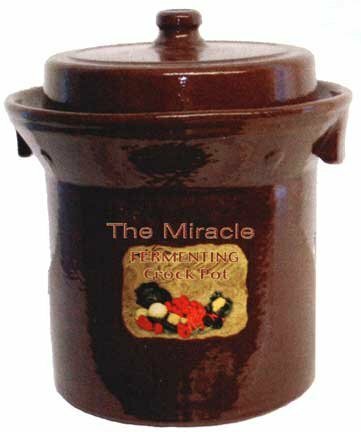 Made in Germany, Harsch Fermenting Crock Pots are also known as Gairtopf Fermenting Crock Pots. Harsch crock pots will allow you to easily make pickled vegetables and sauerkraut. They use ceramic weght stones to eliminate mold in combination with a water sealing system that allows fermentation gases to escape without allowing air to enter the crock pot. The end result produces natural lactic acid fermentation, one of the oldest and healthiest methods of food preservation. Vegetables preserved in this manner develop a deliciously sour taste while retaining their natural vitamins and minerals. You are going to love the quality, taste, and aroma of your vegetables and sauerkraut using the Harsch Fermenting Crock Pot. * Dimensions: 9.5" (240mm) Diameter; 11" (280mm) Height * Weight: 23 lbs. Shipping Weight: 27 lbs. * Capacity: Can ferment up to 5 liters of vegetables or 1.3 gallons at a time. * Composition: Ceramic Clay fired at 1200ï¿½C with a lead free glaze.